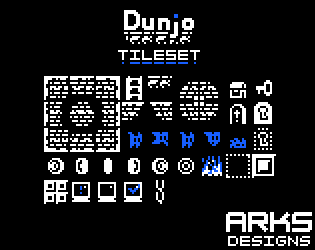 A simple 12x12 pixel tileset that resembels a dungeon setting meant for retro styled games. Dunjo(prev: Banjo) was made as a small side project meant for simplistic, retro styled games. It is simple but useful for testing game ideas, but isn't too expansive. This looks a lot like what Downwell uses as it's art, super cool style! What is the license for this? I saw "Free to use" listed earlier, but to my knowledge that isn't an actual license. Is this available for commercial work? Can the source be edited? CC Attribution 3.0 means that other people can use or modify the work, even commercially, as long as they link to this license and give the proper credit for the work. I put your artwork to use in my very first game! How would you like to be credited? I would like to mention you in the credits or game description. Hey I can't find your twitter handle anywhere? Hey man! I love your tile set and made a game with it! I made some extra sprites like an enemy and bones as well. And of course I credited you as well. Hope this help you set this gorgeous work! Thanks so much for your time, @arks! How to increase image size without losing quality ? 16x16 is very small, almost impossible to see. May seem like a dumb question but honestly i do not know how to do it. I am using Gimp or Krita, I'm learning to use them yet, thanks for the answer, I'll search more about it. Incredible! Can you make a fire animation please? Would love to know if this is free to use, and what license like the person below me. Thanks! I'll be sure to credit anyways. Great assets.